It's a small cafe with around 8-10 seats so is better suited to takeaway. It's bright, airy and welcoming and there's a display cabinet with ready made open sandwiches if you're in a rush. 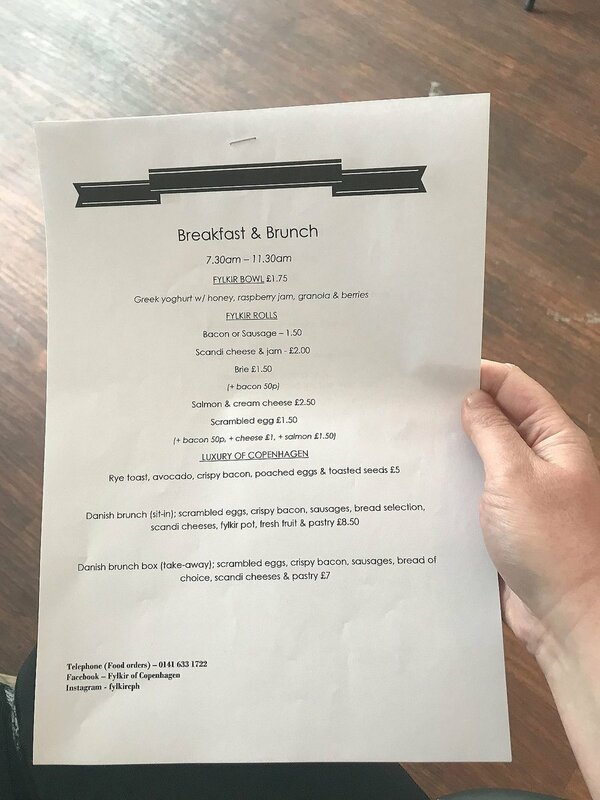 The menu is split into a breakfast menu (available til 11.30) and then lunch. For breakfast, you can get your standard filled rolls but there's also Danish items like Rye toast and Danish brunch available to sit in or takeaway. On the lunch menu, there's a selection of open sandwiches. They're presented on slices of rye bread meaning you can order up to 3 different sandwiches (3 for £6.50) for a filling lunch. I was starving and wanted to try everything so I ordered the hønsesalat (Danish chicken salad, bacon and cress), avocadomad (avocado, Danish blue cheese and seeds) and gravad laks (smoked salmon with lemon cream and peashoots). The salmon sandwich has a 50p supplement. The sandwiches were made fresh and presented on a wooden board. They seem quite small but the rye bread is really filling so three was the perfect size for lunch post-yoga class! I started with the avocado one which was so delicious – I loved the combination of avocado and blue cheese. The chicken one was creamy and had bacon through the mix as well as a crispy piece perched on top. And finally the salmon sandwich was light, lemony and had a tasty smattering of dill on the salmon. I was really impressed by the food. It's fresh, tasty and really delicious. I can't think of anywhere else serving food like this in Glasgow so it's nice to enjoy something a little different. The staff are really warm and welcoming and I'm looking forward to trying more of the menu. Fylkir of Copenhagen are at 134 Newlands Road, Newlands G44 4ER - near Homelea Road. The location is a little strange but worth a trek off the beaten path for their delicious food. Want to know more about Fylkir of Copenhagen? They're on Facebook and Instagram and you can place your lunch order by phone: 0141 633 1722. Want more Glasgow food reviews? If you're in the southside and looking for some great places to eat, I also love Dandelion Café (in Newlands Park), Wild Flours gluten free bakery on Kilmarnock Road (review coming soon!) and Cafe Strange Brew.